The deputy said the man's foot was on the brake pedal. The man, Christopher Ryan Larson, of Trinity, was arrested on Tuesday, the day before he turned 34, according to jail records. When ordered out of the vehicle, he got out - but since it was still in drive it began to roll forward. Following all of this, the deputy asked Larson to submit to the field sobriety test. A deputy had to jump inside and hit the brakes to avoid crashing into a fence. 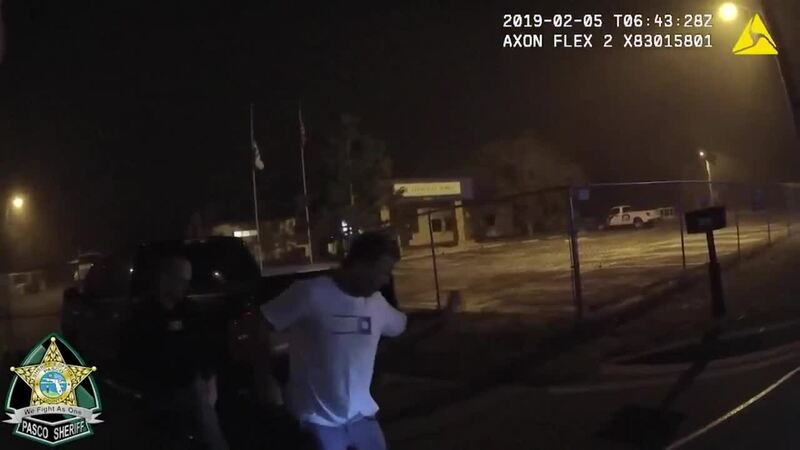 Larson was being investigated because a deputy saw a parked vehicle with its engine running and the driver apparently asleep in the driver's seat, the sheriff's office told Tampa Bay area television station WTVT-Fox 13. That's when the dancing began. Body camera footage shows Larson lose his balance and start dancing during the "walk and turn" test. Body cam video shows Larson bouncing and rowing and spinning at certain points. He said he would not call what he did in the video dancing and he would not comment further on the arrest. When asked if he knew where he was, Larson said he was in Clearwater - which is about 16 miles south of Holiday. Larson was actually parked at a location near Berry Hill Road and Grand Boulevard in Holiday.